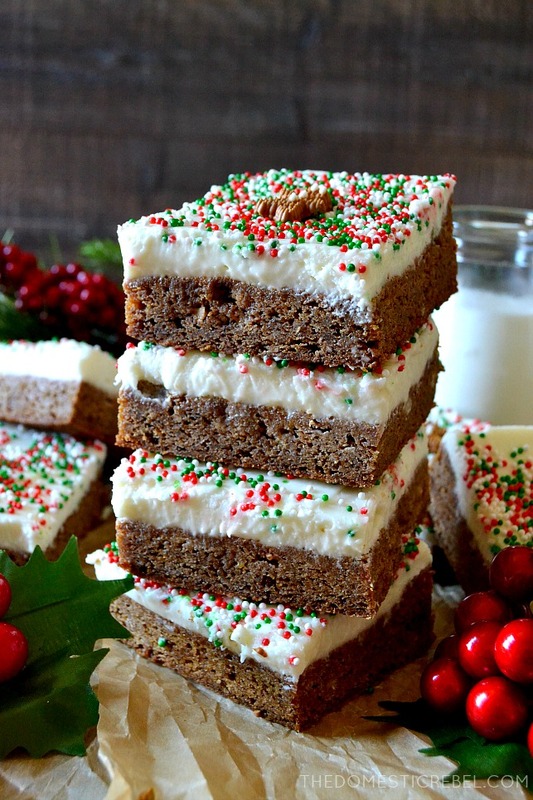 These Gingerbread Blondies are soft, chewy and perfectly spiced and topped with a luscious cream cheese frosting! A fun and easier alternative to cut-out gingerbread men! I am SO weird with ginger. I’m usually not a picky eater, but I am SO picky about this darned spice. For starters, I loathe fresh ginger. It gives me the heebie-jeebies and it tastes like soap to me. It’s unbearable, and I simply cannot order anything with fresh ginger or candied ginger or crystallized ginger in it. NOPE. But: I love ginger ale. It’s my go-to when my tummy’s upset, and it makes a great mixer! Maybe because the ginger flavor is far more subtle? Probably. And during the holiday season, my fave drink at Starbucks is a gingerbread iced chai. Basically, an iced chai tea with one pump of gingerbread syrup. The combination between the aromatic chai spices + gingerbread syrup makes the drink taste like a liquefied cookie! It’s amazing. 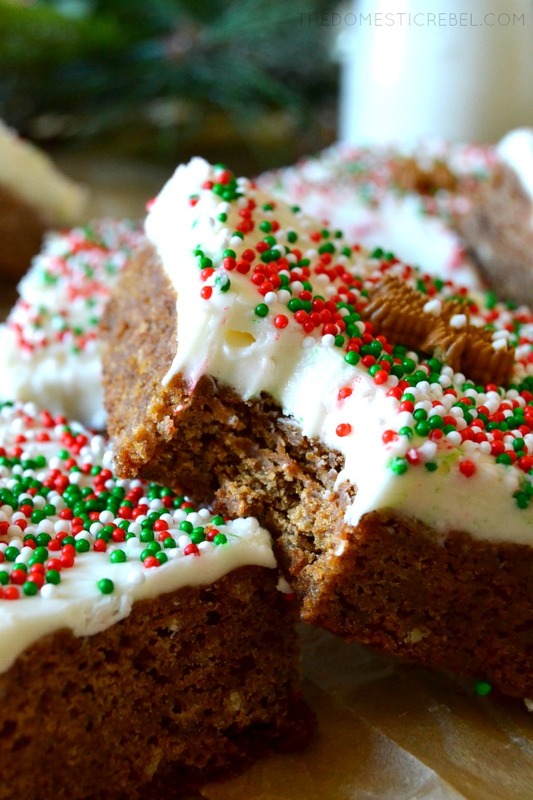 I thought since my track record with ginger is spotty at best that I wouldn’t care too much for these Gingerbread Blondies, but I was seriously wrong! They have just the right amount of ginger that it reads as gingerbread without being overwhelming or too spicy (or soapy to me!). Of course, you can always add in more ground ginger if you prefer things super gingery spiced, but I’m a more tame ginger lover and thus, these were perfect. 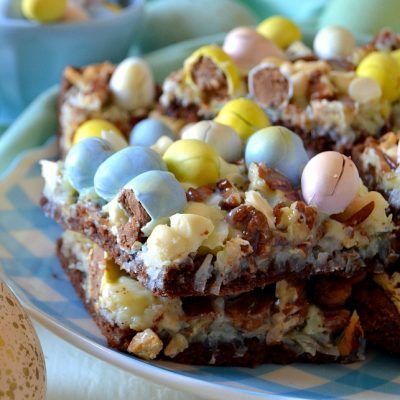 The best part about these blondies, though, HAS to be the cream cheese icing! It’s so light and fluffy and is the perfect tangy complement to the spicy, chewy bars. 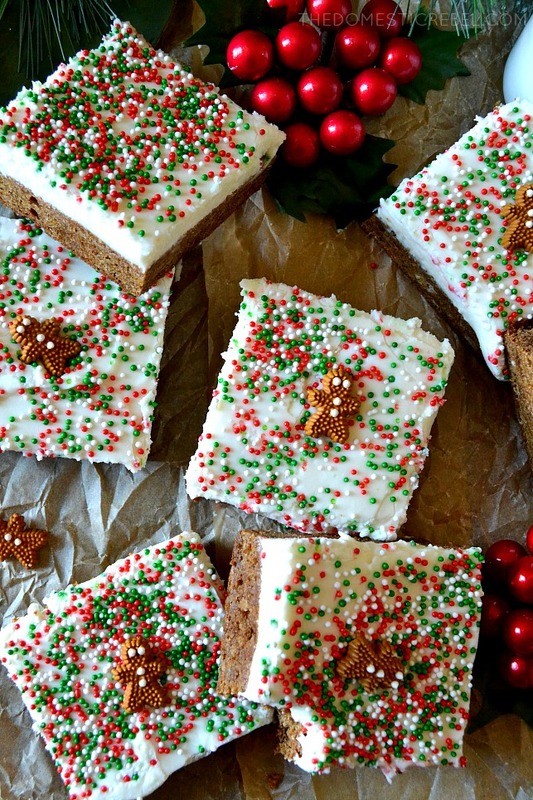 To make them extra festive and sweet, I topped the blondies with holiday non-pareils sprinkles and the cutest little sugary gingerbread men! (I found the men on the seasonal baking aisle at Walmart!). 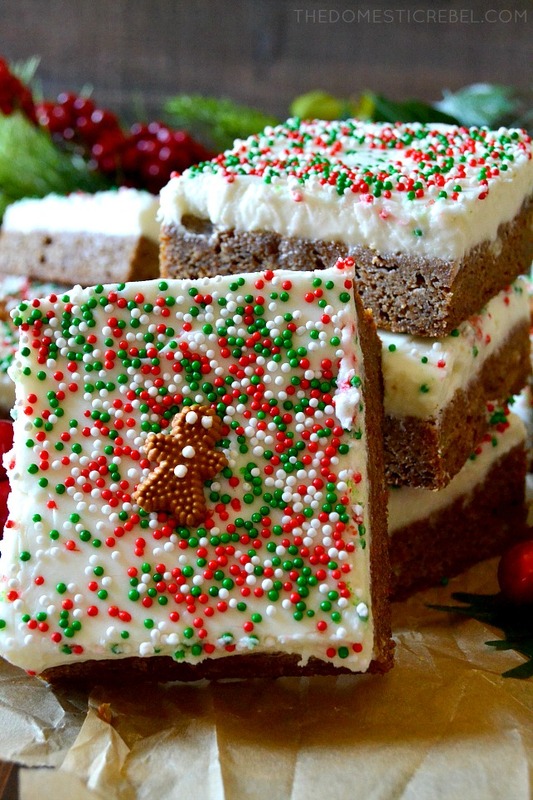 Not only do the gingerbread men help identify what the bars are, they’re just a sweet touch. I totally plan on making a big batch of these and cutting them into tinier squares to gift to my neighbors this holiday season, and you should too! 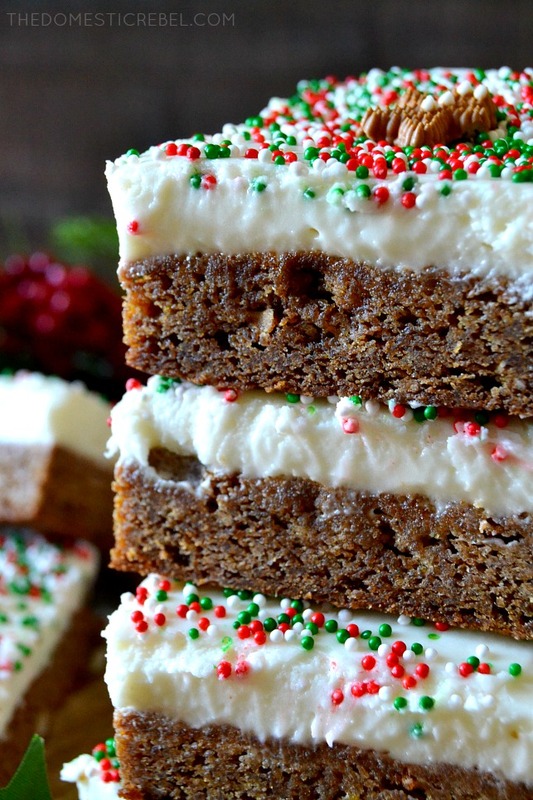 These Gingerbread Blondies are perfectly spiced, soft and chewy bars with a light and fluffy cream cheese icing on top. So perfect for the holidays! In a large saucepan, melt the butter over medium-low heat. Remove from heat and stir in the brown sugar; let cool 5 minutes. Add in the eggs, one at a time, stirring well after each addition, followed by the vanilla, molasses, baking soda, spices, and flour until a soft batter comes together. Spread the batter evenly in the baking pan and bake for approximately 22-27 minutes or until a toothpick inserted near the center comes out clean or with moist crumbs. Cool completely. 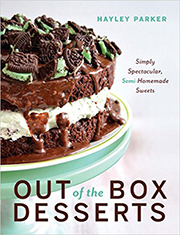 To make the frosting: In the bowl of a stand mixer, cream together the butter, cream cheese, and vanilla on medium speed until fluffy. 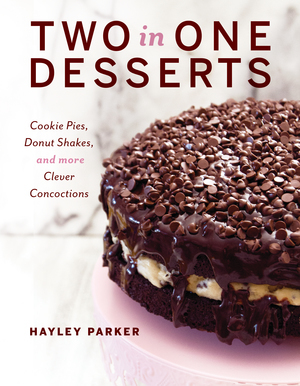 Beat in the confectioners' sugar one cup at a time until frosting is light and fluffy. 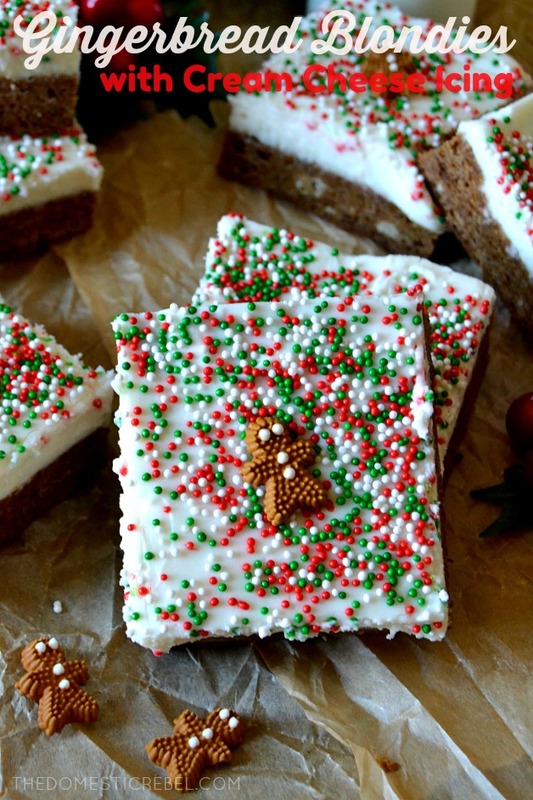 Spread the frosting evenly over the blondies and top with sprinkles, if using. To make a clean-cut square, cover and refrigerate the blondies about 1 hour. 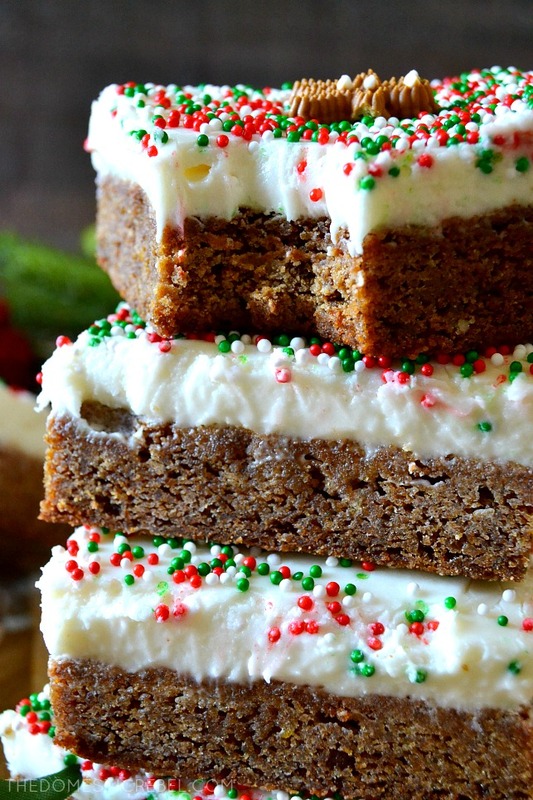 Perfectly spiced, soft and chewy blondies topped with a luxuriously creamy cream cheese icing. What’s not to love?! Wow!!! It looks so beautiful and delicious.